It’s just too hard. I can’t teach high school subjects–I barely even passed Algebra myself. Creating a transcript is impossible! I will fail my child, and he won’t get into college. She won’t get to go to prom if she homeschools through high school. He will miss out on all those high school experiences. High schoolers need socialization. I don’t have time to figure it all out. These are just some of the excuses parents make for stopping homeschooling after the middle school years. 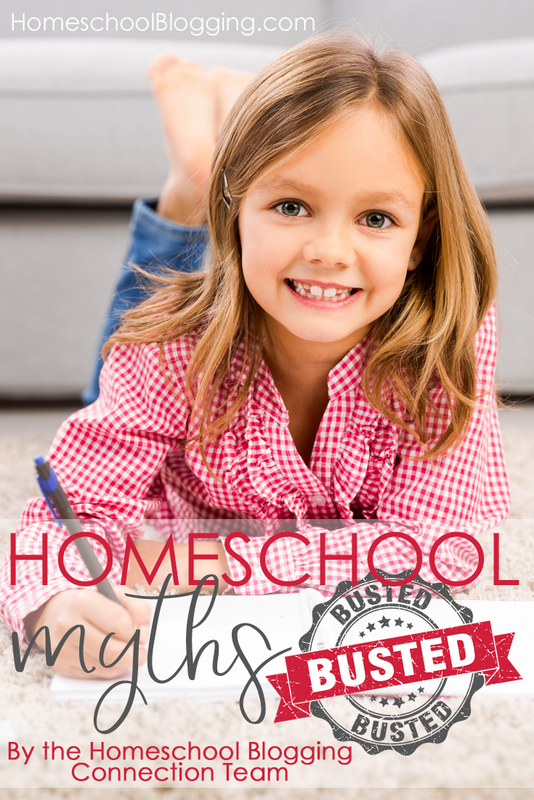 Many homeschool parents are intimidated by the idea of homeschooling through high school. They feel all of the fears listed above, and more. Oftentimes, well-meaning leaders in the homeschooling community add to these fears by making certain ‘high school’ tasks seem more complicated than they need to be–transcripts, for example. But here’s the thing: You CAN homeschool all-the-way-through high school. In fact, your teen needs you now more than ever, but not in the ways you expect. They don’t even really need you for algebra and physics. They don’t really need you to sit down beside them for every subject. Myth #1 It’s too hard to teach high school subjects! 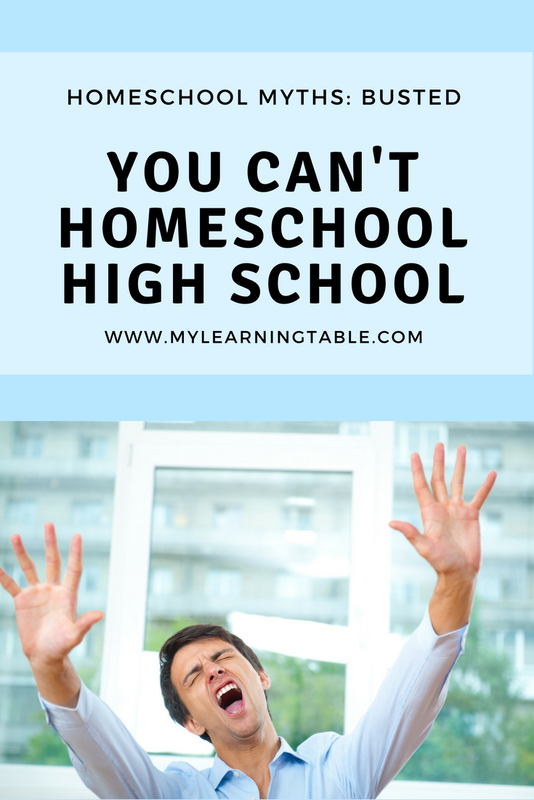 Homeschooling high school is not that much different from homeschooling the early years, except that your teens can become more independent learners. Many high school curriculum guides are written TO the student, with the parent/teacher serving as a guide. You can pretty much give your high schooler ownership of his or her learning journey. Once you have a plan in place for what subjects you need to cover when, let your high schooler have a say in the books and resources you choose to meet your goals. Set a time each week to meet together to discuss what they’ve learned that week. You will be pleasantly surprised at what your teen teaches YOU. If you need a little help planning your high school course of study, check out my High School 4-Year Plan, free for a limited time. I was worried about them too. After doing some research, I learned that you don’t need a fancy program or some magic inside knowledge to create one. If you keep up with your child’s subjects and grades, you simply transfer all of that information onto one sheet of paper, with your student’s personal information at the top. I typed one up for my oldest when he was applying for dual enrollment, and it took about an hour to gather everything, format it in a Word doc, and print it out. It really isn’t complicated. If you are part of a homeschool accountability association, they will usually prepare one for you. Really? Okay, I’ll address this. For me, personally, high school wasn’t all filled with ‘good’ socialization. Yes, I attended prom. Yes, I attended graduation. Etc. Etc. Have my boys missed out on these opportunities? Well, according to them, no. There are plenty of opportunities for homeschoolers to be social, and in a much healthier way than traditional high school socialization. If it is really important for your teen to go to prom, you might find a homeschool one in your area. And, you can still have a graduation. Whether you participate in one with your accountability association, or arrange a family gathering, it will be special, cap and gown optional. What is a graduation really all about, anyway? Think about how to make the day what you and your teen want it to be. I’m going to leave it at that, for now. If you set aside some time to sit down with your teen and plan your high school year, you will find that you can make it work. Figure out a plan of study, estimate the time required to get it done each week, and set your expectations. Both of you can collaborate to ensure that your teen is working toward a goal. Are they planning to attend college, pursue a technical degree, join the military, pursue an entrepreneurial venture, or go straight into the workforce? Keep these goals in mind when deciding the best plan of attack. Check into your state’s requirements for graduation, and decide what courses your student needs. Write everything down, and set a schedule. Remember to be flexible, though. Life happens! And another thing about time. It really, really does fly. Before you know it, your teen will be off on his own. You can never get these years back, and I’ll tell you from experience–the relationship you build and nurture with your teen is priceless. Continue to be a part of their lives, and keep building that bond you established in your early years of homeschooling. You won’t regret it!